Keywords: Environmental education facilities, Climate Change, Euroregion of the Atlantic Axis, decarbonization, environmental education centers. Current patterns of food consume have high in uence on Climate Change (CC), which has an ongoing “Mediterranization” pattern in the north of Iberian Peninsula. Since the change of behavior is the most critical component in this matter and being diet patterns one of the aspects in which personal decisions most can in uence this change, it is important that resources such as the Environmental Education Facilities (EEF) act at a community level. This project aims to promote the EEF as mediators between CC-food patterns and the local communities, within the Euro Region of Eixo Atlântico (Galicia, Spain and the Northern Portugal). Throughout a methodology of investigation-action (I-A) and using three levels of EEF – a pilot EEF, a restrict set of EEF, and a wider set of EEF – it will be developed a sociopedagogical intervention. The rst two levels will participate in groups of I-A and all the levels will have training courses. It is expected that this projects leads to an e ective change of behavior among citizens and communities concerning CC. Adger, W.N., Barnett, J., Brown, K. Marshall & O’Brien, K. (2012): “Cultural dimension of Climate Change impacts and adaptation”, em Nature Climate Change, 3, pp.112-117. Agência Portuguesa do Ambiente (s/d): PR COP21, Adaptação no Acordo de Paris, disponível em http://climadapt-local.pt/wp-content/uploads/2016/02/20151203-PR-COP21_Adaptacao-Acordo-de-Paris.pdf, consultado em 17-06-2016. Aguilar, O.M. & Krasny, M.E. (2011): “Using the communities of practice framework to examine an after-school environmental education program for Hispanic youth”, em Environmental Education Research, 17(2), pp.217-233. Allen, L.B. & Crowley, K. (2014): “Challenging beliefs, practices and content: How museum educators change”, em Science Education, 98(1), pp. 84-105. Allen, L.B. & Crowley, K. (2017): “Moving beyond scientific knowledge: leveraging participation, relevance and interconnectedness for climate education”, em International Journal of Global Warming, 12(3-4), pp. 299-312. Arto, M. & Meira, P.Á. (2017): “Climate literacy among university students in Mexico and Spain: influence of scientific and popular culture in the representation of causes of Climate Change”, em International Journal of Global Warming, 12(3-4), pp. 448-467. Baleiras, R.N. (2009): “Caminhos para a Política de Coesão 2014/2020”, em Eixo Atlântico – Revista da Euroregião Galiza-Norte de Portugal, 16, pp. 17-48. Blanco, G., Gerlagh, R., Suh, S., Barrett, J., Coninck, H.C., Morejon, C.F., Mathur, R., Nakicenovic, N., Ahenkora, A.O., Pan, J., Pathak, H., Rice, J., Richels, R., Smith, S.J., Stern, D.I., Toth, F.L., & Zhou P. (2014): “Drivers, Trends and Mitigation”. In O. Edenhofer, R. Pichs-Madruga, Y. Sokona, E. Farahani, S. Kadner, K. Seyboth, A. Adler, I. Baum, S. Brunner, P. Eickemeier, B. Kriemann, J. Savolainen, S. Schlömer, C. von Stechow, T. Zwickel and J.C. Minx (eds.). Climate Change 2014: Mitigation of Climate Change. Contribution of Working Group III to the Fifth Assessment Report of the Intergovernmental Panel on Climate Change (New York: Cambridge University Press). Bisquerra, R. (2000): Métodos de investigación educativa. Barcelona, CEAC Educación. Boer, J., Witt A. & Aiking (2016): “Help the Climate, change your diet: A cross-sectorial study on how to involve consumers in a transition to a low-carbon society”, em Appetite, 98, pp. 19-27. Bogdan, R. e Biklen, S. (1994): Investigação qualitativa em educação: Uma introdução à teoria e aos métodos. Porto, Porto Editora. Cameron, F., Hodge, B. & Salazar, J.F. (2013): “Representing Climate Change in museum space and places”, em WIREs Climate Change, 4, pp. 9-21. Capstick, S., Whitmarch, L., Poortinga, W., Pidgeon, N. & Upham, P. (2015): “International trends in public perceptions of climate change over the past quarter century”, em WIREs Climate Change, 6, pp. 35-61. Carvalho, S.C. (2015): Potencialidades e práticas de integração das dimensões sociocultural e biofísica em equipamentos para a educação ambiental: estudos de caso do Eixo Atlântico (Norte de Portugal e Galiza), tese de doutoramento. Santiago de Compostela, Universidade de Santiago de Compostela. Carvalho, S.C., Azeiteiro, U.M. & Meira, P.A. (2011): “Equipamentos para a Educação Ambiental na zona costeira da Euroregião do Eixo Atlântico – Das práticas conservacionistas às sociocríticas”, em Journal of Integrated Coastal Zone Management, 11(4), pp. 433-450. Collins, K. & Ison, R. (2009): “Jumping off Arnstein’s ladder: Social learning as a new policy paradigma for Climate Change Adaptation”, em Environmental Policy and Governance, 19, pp. 358-373. Delgado, J.M. & Gutiérrez, J. (1998): Métodos e técnicas cualitativas de investigación en Ciencias Sociales. Madrid, Editorial Síntesis. Faber J., A. Schroten, M. Bles, M. Sevenster, and A. Markowska (2012): Behavioural Climate Change Mitigation Options and Their Appropriate Inclusion in Quantitative Longer Term Policy Scenarios, Dinamarca: Agência Europeia do Ambiente, disponível em http://ec.europa.eu/clima/policies/roadmap/docs/main_report_en.pdf, consultado em 17-06-2016. Garnett, T. (2011): “Where are the best opportunities for reducing greenhouse gas emissions in the food system (including the food chain)? Em Food Policy, 36, pp. S23-S32. Hallstrom, E., Roos, E. & Borjesson, P. (2014): “Sustainable meat consumption: A quantitative analysis of nutricional intake: greenhouse gas emissions and land use from a Swedish perspective”, em Food Policy, 47, pp. 81-90. Intergovernamental Plannel for Climate Change (2014): Climate Change 2014: Mitigation of Climate Change. Contribution of Working Group III to the Fifth Assessment Report of the Intergovernmental Panel on Climate Change [Edenhofer, O., R. Pichs-Madruga, Y. Sokona, E. Farahani, S. Kadner, K. Seyboth, A. Adler, I. Baum, S. Brunner, P. Eickemeier, B. Kriemann, J. Savolainen, S. Schlömer, C. von Stechow, T. Zwickel & J.C. Minx (eds.)] (New York: Cambridge University Press). Laestadius, L. I., Neff, R.A., Barry, C.L. & Frattaroli, S. (2014): “We don’t tell people what to do: An examination of the factors influencing NGO decisions to campaign for reducing meat consumption in light of Climate Change”, em Global Environmental Change, 29, pp. 32-40. McCrum, G., Blackstock, K., Matthews, K., Rivington, M., Miller, D. & Buchan, K. (2009): “Adapting to Climate Change in Land management: the role of deliberative workshops in enhancing social learning”, em Environmental Policy and Governance, 19, pp. 413-426. Meira, P.Á. & Pinto, J.R. (2008): “A educação ambiental em Galicia e Norte de Portugal: Uma valoração estratégica desde a perspectiva local no Eixo Atlântico”, In: L. Cunha e M. Santiago (orgs. 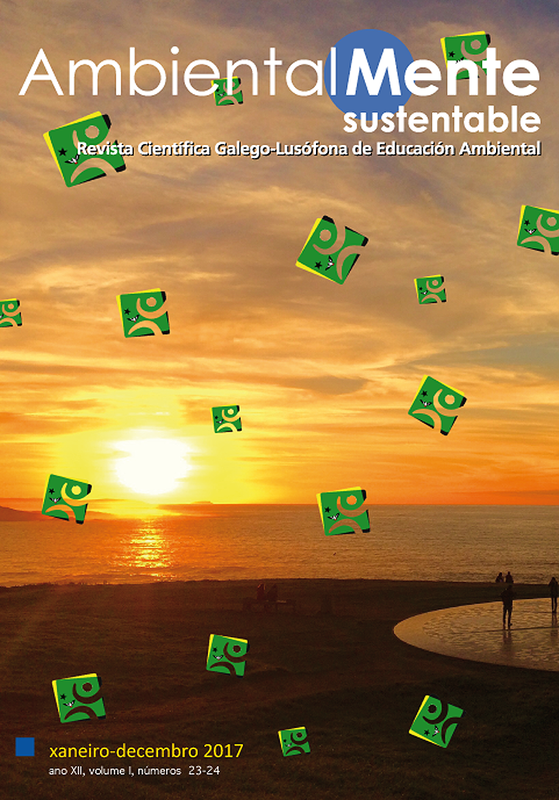 ), Estratexias de Educación Ambiental: Modelos, experiencias e indicadores para a sostenibilidade local, pp. 31-82. Vigo, Eixo Atlântico do Noroeste Peninsular. Meira, P.Á., Arto, M. Heras, F. e Souto, P.M. (2011): La sociedad ante el cambio climático. Conocimientos, valoraciones y comportamientos en la población española. Madrid, Instituto de Prevención, Salud y Medio Ambiente, Fundación MAPFRE. Neves, A.P. (2011): Representações sociais das alterações climáticas: um estudo sobre a relação entre formação científica e cultura comum em Portugal, tese de doutoramento. Santiago de Compostela, Universidade de Santiago de compostela. Sampieri, R.H., Collado, C.F. & P.B. (2007): Metodología de la investigación (Mexico: Mc Graw Hill). Serantes, A. (2011): Os equipamentos para a educación ambiental en Galicia: Análise da realidade e propostas de mellora de calidade, tese de doutoramento, Coruña, Universidade da Coruña. Serantes, A. & Barracosa, H. (2008): Contributos dos equipamentos de educação ambiental para as estratégias de acção local. Estudos de caso na Galiza e no Norte de Portugal, In: L.I. Cunha e M.P. Santiago, Estratexias de Educación Ambiental: Modelos, experiencias e indicadores para a sostenibilidade local, pp. 179-200. Vigo, Eixo Atlântico do Noroeste Peninsular. Sorrosal, A. (2010): “Las redes de cooperación, seña de identidad del Eixo Atlántico”, em Eixo Atlântico – Revista da Euroregião Galiza-Norte de Portugal, 17, pp. 113-120. Unións Agrarias (s/d): Estrategias para la mitigación del Cambio Climático en el sector agroforestal (Galicia) disponível em http://www.unionsagrarias.org/lifecambiarocambio/docs/Estrategias_para_la%20_mitigacion_del_cambio_climatico_en_el_sector_agroforestal.pdf, consultado em 17-06-2016. Vaughter, P. (2016): “Climate Change Education: From Critical Thinking to Critical Action”, em Policy Brief, 4, pp. 1-4.